I`m beginning to see a thread of connection being woven as my painting journey has evolved. A journey that has unfolded through moments sparked by sudden intuition, transition and guidance by Grace. 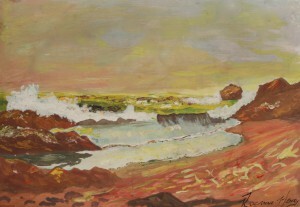 This was my 16 yr old self, painting this seascape. Little did I know, that just over 30 years later, I`d be sharing this painting with you and connecting it to where I am now. The other morning, just after 5am, during my early morning meditation time, I had the urge to fetch this particular painting out of the boxes in my garage. At that time in my life, I had a great love for the sea and swimming. It was my most favourite past time with friends. I painted this piece for my granny. We had just lost our grandfather and I wanted to do something for her. I sat at my desk in my bedroom, where I did my homework every afternoon and began painting this. I then wrote her a note, using aspects of the painting to comfort her. I used the bold strength of the rocks, the warmth of the sunset, the movement of the waves as physical reminders of the same qualities found in a Higher Power that was always close by. I remember writing something about the radiant colours of the sky reflected in the sand as well. I used things that held so much meaning for me personally, to offer this healing balm for her. Initially it may seem to have only an aesthetic purpose, but she and I knew there was more to it. It has hung in her home for many many years and after she died, almost 20 yrs ago, I still have it with me. I spent a lot of time at her home, not only as a child but as a young woman, after my day at the Teachers Training College which was close to her home. 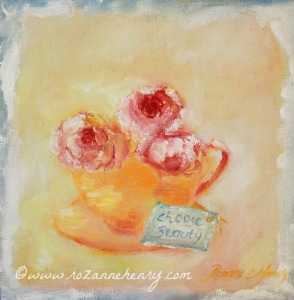 She loved roses so much and often drew them with teacups. I painted this one when I remembered this about her. 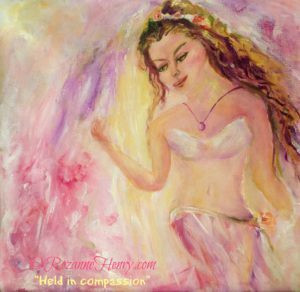 It is interesting that I chose the quality of beauty to be the message for this painting at a time of much change in my own life. It feels like my creativity is being guided and has become my new teaching tool. I painted this one during a time of enormous transition. It was one of the first paintings I did where I completely bent the rules. I painted the pathway all sorts of jewel – coloured tones because that was the joy I was feeling as I painted this. Beyond the entrance lay a mystery – something wonderful and beautiful to go and discover. Who knew what it could be….. 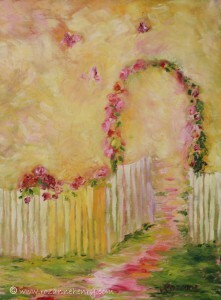 I just knew I wanted to move along that pathway…through the opening in the gate….into something new…..
I`ve had this painting hanging in my home, reminding me of my connection to a sense of the freedom I was moving towards. I am ready to let it go and allow someone else to feel the sense of freedom and expectation that I felt when I painted this. I am offering this painting at a greatly reduced price because I am beginning to allow space for new paintings to begin emerging. During our previous move, a section of the painting developed a few cracks but looks like this when standing back to view. It still nonetheless feels like it is time to share this moment of freedom with someone else. If you are interested, you may email me to discuss a good shipping price as it is larger than the ones I have on my website. It is not listed on my website so I have created the Paypal button here. Those living locally can collect directly from me. I`m in awe of the link between intuition, creativity and connection. PS: Next week I will be sharing more examples of his .